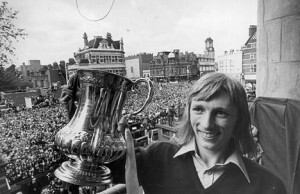 Former West Ham striker Alan Taylor is best known for his goalscoring exploits in their FA Cup success of 1975, culminating in two goals in that season's final. At the end of 1974, West Ham manager John Lyall decided to trust his judgement and pay Rochdale £40,000 after seeing Taylor score ten goals in five games for Rochdale. Taylor signed for the club on his 21st birthday. With some good fortune, Taylor was able to play in West Ham's FA Cup campaign when they joined the competition at the third round stage in January 1975, even though Rochdale's lower league status meant that they had started two round earlier. West Ham made progress to the quarter finals and Taylor scored both goals as they beat Arsenal 2-0 at Highbury. The semi-final against Ipswich Town ended goalless and went to a replay at Stamford Bridge, with Taylor again scoring both goals in a 2-1 win, the second of which clinched a place in the Wembley final with just eight minutes to go. In the final, West Ham played Fulham, and the game was tightly-contested until Taylor stepped in with two goals which won West Ham the FA Cup. Taylor made all the headlines as West Ham won 2-0, especially as he had scored three consecutive FA Cup braces and had been a player in the lowest division of English football just six months previously. It took eleven years before another player scored two goals in the FA Cup final. Taylor retired from the game in 1989 after playing for other clubs such as Norwich City, Cambridge United, Hull City, Burnley and Bury, plus some time in Canada at Vancouver Whitecaps.